Support the Women’s eNews Arabic Site | Fem It Up! I’m sure many of you are familiar with Women’s eNews. It’s a fabulous news organization that focuses on issues of “particular importance to women.” The site is a much needed alternative to the slew of media that far too often ignores, marginalizes and discounts stories about our gender. What’s particularly great about Women’s eNews is that is also has an Arabic site. The Arabic version doesn’t just rehash English articles but offers unique content as well. In January, Rita Henley Jensen, the founder and editor-in-chief of Women’s eNews, visited me in Doha, Qatar. She was touring the Middle East to brainstorm ways to raise funds and expand the Arabic site. 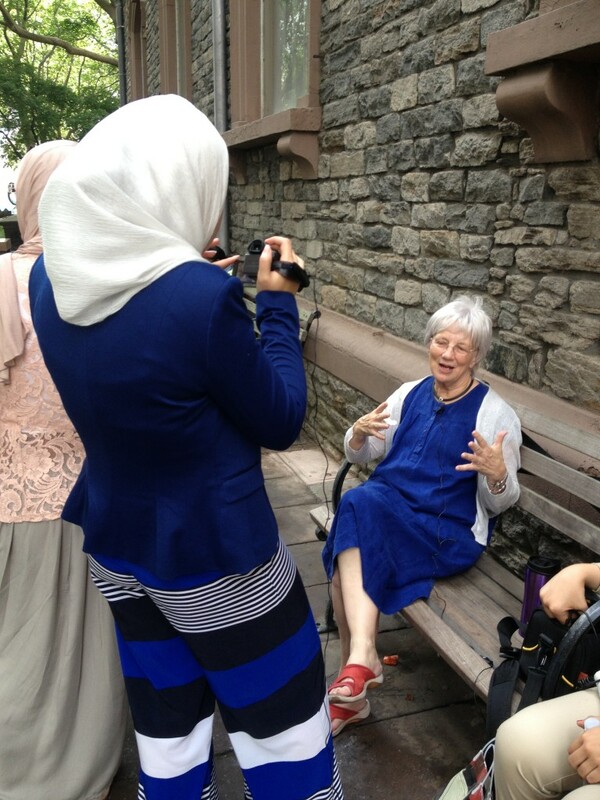 My students interviewing Rita Henley Jensen, founder of Women’s eNews, in NYC last summer. Unfortunately, I recently received an email from Rita explaining that the Arabic site is going on hiatus because she wasn’t able to raise enough money yet to support it. I hope the feminist community will read this blog post and take action. Support the Women’s eNews Arabic site by donating now or even consider becoming a board member. Click here to learn more. Even if you don’t donate, I hope you will consider signing up for the Women’s eNews newsletter and forwarding on their articles to your colleagues and friends. Women’s issues and stories deserve to get widespread coverage. Women’s eNews fills that void and so much more.